Chemical Mixing is a common process used by for different purposes. Industries as pharmaceutical, cosmetics, food, mineral and plastic utilize chemical mixing to achieve the best homogenization of their products. The chemical mixing process includes different parts as, blending, emulsification, particles size reduction and finally homogenization. Chemical Mixing is achieved thanks to tank mixers able to carry out this process. Drum mixers, are gallon drums that rotate in order to mix chemicals and materials in tanks. Drum mixers are generally used to blend mixtures of low to medium viscosities such as cement or adhesive slurries. This kind of mixer is capable of mixing substances of very different particle sizes such as gravel and cement slurry. Pulsair mixing tank systems has developed a powerful 55 gallon drum mixer that can mix any liquids in any tank size. It happens thanks to a large compressed air/gas bubble that makes this process faster than mechanical mixers, cheaper, lower energy consumption and zero in tank maintenance. 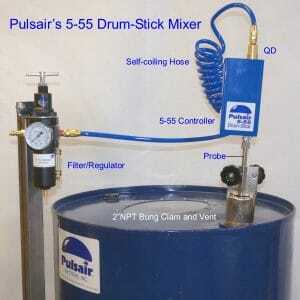 The Pulsair 55-gallon drum mixer works by pulsing in large bursts of compressed air. And also for inert gas through a stainless steel probe in the bottom of the drum. Therefore the drum mixer can operate at any liquid level. And also it is and excellent for re blending separated liquids or re-suspending settled solids in a matter of minutes.